Some of my readers make whole wheat pizza dough, homemade tomato sauce, own a pizza stone, and create amazing pies in their oven. Thank you for reading Snack-Girl, Martha Stewart. The REST of us open a box and toss a frozen pie in a preheated oven waiting the 10 minutes it takes to heat and are finished. Or, we just call a number and a sweet teenager shows up with a steaming cardboard box. There is a middle ground between the Martha's of the world and the rest of us. You just need to believe! 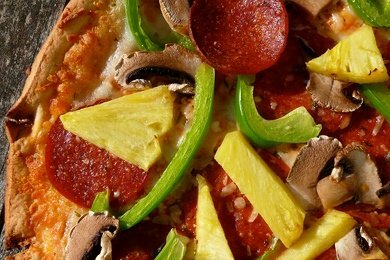 Simply add some of your favorite fresh vegetables to your favorite frozen pizza and you could look like a gourmet goddess. For the pizza above, I used a Newman's Own Pepperoni Pizza. I hear that Amy's has a pretty great frozen pizza, too. Then, I sliced mushrooms, green pepper, and pineapple and tossed it on before I put it in the oven. Doesn't it look delicious? And it tastes SO much better than just the pizza alone - or the pizza with pre-frozen vegetables. The vegetables are going to add negligible calories to the finish product. Get creative with this. All you have is apples and celery in your fridge? Try it! Take whatever fresh fruit or vegetable you have in your fridge and create something new. Pizza is an excellent "vegetable delivery device" for kids and adults. Broccoli, spinach, kale, and other green things (that people hate) just taste better with cheese. As for take-out pizza, just make sure they put lots of vegetables on it. Just avoid Evil Pizza! What do you add to pizza to make it nutritious? Please share! Do You Need Some Inspiration to Become Healthier? I usually buy plain cheese frozen pizza, add some turkey pepperoni (Wilson's is my favorite brand, can't even tell its turkey), mushrooms, and chopped up tomato. I might have to try a variation with the pineapple on top for dinner tonight, sounds good! I make my own individual pizzas using the flatout wraps.You just stick them in the oven for 7 minutes, throw on the sauce, cheese, and veggies (I use weight watchers cheese to save calories)and stick it back in the oven for another 7 minutes. Crispy and delicious! Before I started making my own pizzas, I used to buy Newman's Own. It's good and much more moderately priced than Amy's. I always loved the 4-cheese but my husband loved pepperoni. I would be self-described pizza addict and I had to realize the difference in healthy pizza from the evil pizza. It took a while for me to really "get it". I've drastically changed the way I make pizza - and try to avoid buying it or ordering out for it, because inevitably I end up with crap. It tastes good, devilishly good, but then 3 hours later I feel lethargic and in need of a nap. I've learned making it at home is way much better. I usually get the pre-made dough from Trader Joe's - I'm no Martha Stewart - and then I can control the amount of cheese while piling on the veggies.. YUM! I've been doing this for years! This is also the best way to make sure everyone gets exactly the vegs they want on their slice(s)... i love all the vegs, but the rest of my fam has their own specific requests... we do 1/3 for me and 1/3 for my kids and 1/3 for my hubby. So easy! Also, a trick i learned from Rachael Ray - reheat leftover pizza in a dry non-stick skillet on med head with foil on top - crispy bottom, warm top, and perfect every time. Beats the microwave! Thanks for the tip. I love "pizza margherita" frozen pizzas on thin crusts with asparagus and broccoli slaw as additions, with pepper flakes for "kick." I have been creating my own healthy version of the frozen pizza for so long now that the thought of a crap delivery pizza makes me sick. I usually take a frozen Trader Joe's four cheese pizza and add fresh tomato, chopped onion and garlic, mushrooms, sliced black olives and sliced zucchini. Sprinkle Italian seasoning on top and bake on a pizza stone in the oven for 12 minutes. Also another great tasting pizza you can make easily is with a frozen cornmeal pizza crust from Whole Foods. Brush on a little olive oil, then spread a thin layer tomato paste over the crust, add fresh mozzarella or low fat cheese and pile on whatever veggies you want. Taste is fabulous! Try making small quick pizzas on whole wheat pita bread too. Ive been making pizza with Boboli whole wheat crust.. we add cooked turkey bacon, turkey pepperoni and jalapenos and low fat mozzarella ! It's our favorite from the local pizza parlor but we don't want the white flour crust and grease anymore! It tastes different of course but absolutely delicious! We also make a delicious BBQ chicken pizza. Excellent.